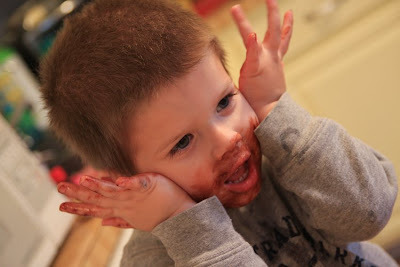 Making candy is messy business! My sister spent the day with me in the kitchen making all kinds of holiday candies and goodies for us to EAT (I mean GIVE AWAY!). I really need to give plates away fast or else I will EAT until my teeth fall out (that’s a line from Andrea!) and my pants don’t fit me anymore (that’s me!). I thought I’d share some of my amazingly scrumptious candy recipes with you. Enjoy! Before you start cooking: measure 2 cups corn syrup; set aside. Mix together sweetened condensed milk and flour; set aside. Have everything close by. Spray a 9×13 pan with Pam or spread with butter, bottom only. Melt butter in a large (3 qt or larger) non-stick pan. Add corn syrup and sugar. Bring to boil on med heat, stirring often, and boil for 5 minutes. 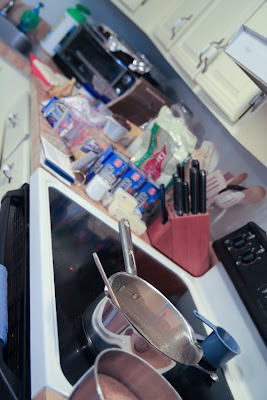 Remove pan from heat and stir in milk/flour mixture. Boil over med heat, stirring constantly until mixture darkens and reaches a medium hard ball stage (235º on candy thermometer). Remove from heat and stir in vanilla. Turn into greased pan and cool completely. Cut into 2 inch pieces with a buttered knife. Wrap pieces in small squares of wax paper. Makes over 100 pieces, but really I lose count every time. 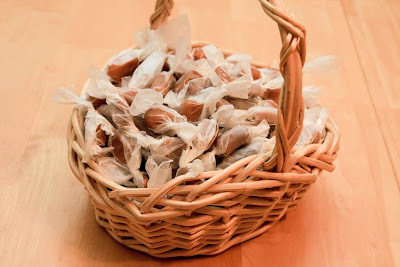 Grandma used to always have a batch of this candy around, waiting for visitors. After she passed away last year, someone in the family asked me if I wanted to look through her recipe box before they were all thrown away. I jumped at the chance. 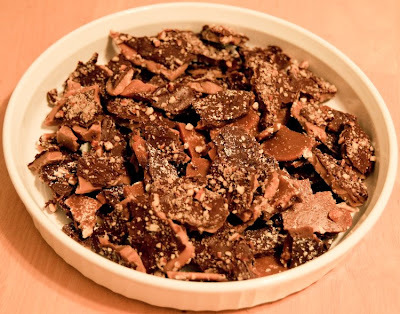 I found her English toffee recipe filed away, and quickly grabbed it for my own, even though I already had a copy. It may not be a unique recipe, but it is chock full of memories. Melt butter in pan. Add sugar and salt. Cook over med. High heat until medium brown stage is reached (caramel color). Take off heat. Add vanilla. Have cookie sheet ready (I like to line mine with aluminum foil). Pour half of the ground nuts on sheet. 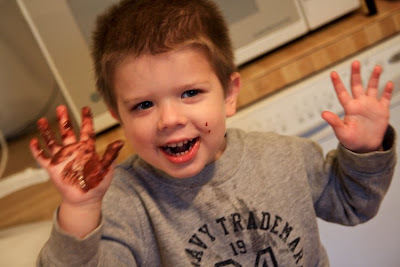 Then pour hot candy mixture on cookie sheet. While hot, spread candy out by pressing with back of large spoon until candy is the desired thickness. 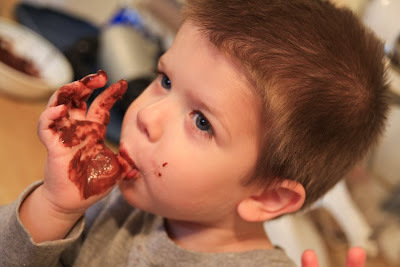 Sprinkle chocolate chips over hot candy and let them melt. 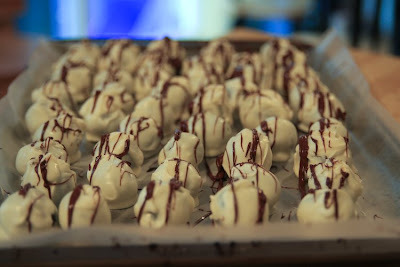 Once they’re softened, spread the chocolate out with a knife or spoon and sprinkle with remaining nuts. Let cool completely, then break into bite-sized pieces. Keep dry. **Note, quite by accident, my sister and I made toffee with WHITE chocolate. I will be making this again for sure!! Another family tradition. 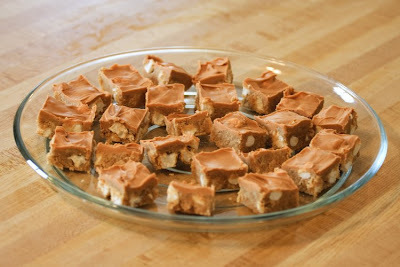 Nobody makes anything like them….well, not until I shared the recipe with everyone I know…… They are always a hit, and the easiest candy on my holiday list to make. Combine eggs, sugar, and butter in saucepan. Bring to rolling boil and cook for 2 minutes, stirring constantly. Remove from heat and cool. Add marshmallows, nuts, and graham cracker crumbs. Pat mixture into 9×13 pan. In microwave safe bowl, heat butterscotch chips at half temperature for about 30 second intervals. Stir between each heating until the chips have melted smooth. Stir in peanut butter; mix well. Spread over crumb mixture. When cooled, cut into 1”x2” bars. These store best in the refrigerator. Now here’s the queen of secret family recipes. 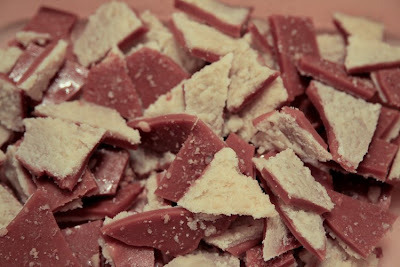 The ladies in my family (the generation above me) hounded my Great Aunt Fern for her stellar fudge recipe for years. She would not budge. It was a secret! Years and years went by before my Grandma was talking about the famous fudge with Fern’s sister. Grandma was lamenting the fact that Fern wouldn’t give the recipe to her. Fern’s dear sister said to Grandma,”I have that recipe. Let me get it for you.” And thus ended the days of the secret recipe. :) My mom tweaked this recipe so that she made many variations–Rocky Road (add nuts and marshmallows), Peanut Butter (add peanut butter and butterscotch chips in place of the chocolate chips), and my newest favorite, the one my sister and I tried again this year: White chocolate fudge with caramel. –Put these 4 ingredients into a large pan and bring to boil over medium high heat. Stir constantly for 6 minutes (after boil). Add hot mixture to the mixing bowl with the first ingredients. Stir until melted and smooth (I used my dough hook and mixed on low for this step). You can add 2 cups of chopped nuts at this point if desired. © 2008 – 2015, Food Fun Family. All rights reserved.